Mark’s Update: The Confidence Fitness model covered here is no longer listed. Fortunately, there is an almost identical equivalent from the popular UltraSport. I recommend you check out their best-selling mini-bike. You’ll find the gallery, feedback and (hopefully!) latest discount on this amazon.co.uk product page. Summary: The Confidence Sit Down Mini Bike is a compact, lightweight and highly transportable alternative to a regular exercise bike. Ideal for use anywhere in the house (or even under your office desk), this will improve those fitness levels and help those calories burn off. This one has some excellent customer feedback, see the product page at amazon.co.uk for details. A compact, mobile, mini exercise bike ideal for keeping those fitness levels up. The Confidence sit down mini bike is in the lower budget range – and is an ideal piece of fitness equipment for those with limited space too. Obviously you’ll get to workout your legs, though you’ll also find this a great starting point for some serious cardio. Confidence also suggest that you can use this one for arm exercises when placed on a surface – though I’m not so sure this is the best use myself! Having said that, who wouldn’t like the chance to burn some calories while watching the TV! 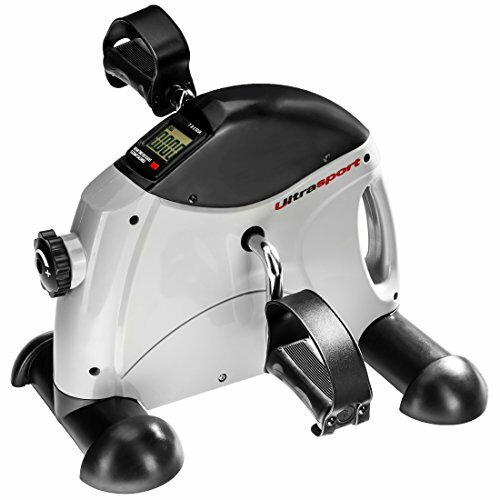 This lightweight mini exercise bike is easily transportable and keeps track of your workouts too with the on-board computer. There is a tension screw to keep the intensity levels in tune with your fitness progress. The whole unit is just 43cm high, which really does make it easy to store away between uses. Even with the low price point, you’ll get a LCD screen which displays all the vital stats such as distance, speed and calories burned. The computer automatically scrolls between these measurements (and the less useful RPM) while you pedal. Reviews / comments state that this mini-bike is ideal for use on a carpet, much sturdier and not sliding around like some other models, although you can invest in some cheap non slip matting if you are using the bike on a more solid surface. People of all fitness levels have enjoyed the benefits of the bike, with elderly users and those recovering from injury particularly impressed with the benefits they have gained. The bike is also said to be very straightforward in setting up. It is hard to please people when it comes to fitness equipment, and this sit-down mini bike has excellent feedback for a budget range model. People looking for a quick and easy workout that won’t take up too much room will be more than happy with the Confidence Sit Down Mini-Bike. It’s light and therefore easily transportable; the small size meaning storage is less of a problem than most other pieces of exercise equipment. The LCD display helps you keep track of your workout too. Check this item (and the feedback) out for yourself now on the product page at Amazon.co.uk!